This is a really simple text-only WAP page you can use to link to your Department of Transportation's traffic cameras. This file is already included in Wapscout. Most cities and states in the U.S. now have live traffic cameras that can be monitored from web browsers. Here in Georgia, they update every 4-5 minutes to give you a pretty good idea of what it really looks like out there. We simply chose the small images that are displayed on the site and hot linked to them by opposite clicking on the image and finding out the address. New York City, for example, updates their traffic cameras every few seconds, so users there will get a very good image and a very good view of real-time traffic conditions. Most phones will handle anything up to 640x480, but you'll have better luck and faster downloads if you use the smallest images your DOT makes available. 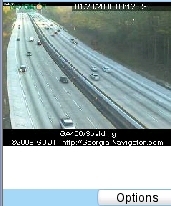 The images on the right give you an idea of how the traffic cameras will display on the phone and the text-only Menu. All of that is easily modified. 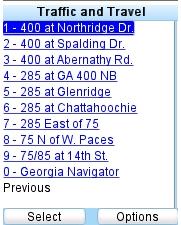 On our page, we included a link to traffic alerts that is provided by the Georgia Dept. of Transportation, called "Georgia Navigator." The menu works using either the numeric keypad to quickly choose a camera, or scrolling down the list and pressing 'OK' for the camera we want. It's a really simple matter of entering your own camera names and the URL corresponding to that camera. In that case, you have to find the correct URL that will producer the image by adding the main page address and testing it in any web browser. You can always look at how they're getting the image by opposite clicking on the edge of the background and viewing the SOURCE page code. In the case of New York City, it would appear it's always better to link to those cctv__.jpg addresses to get a live camera that's going to give you a constantly updated image. Check the forums here for a version of the main menu you can download that will put TRAFFIC a named key on your Wapscout graphic menu. © Copyright 2006 gearscout.com - All Rights Reserved.